INDIANAPOLIS – Hundreds of high school sophomores from around the region recently attended “Embracing the Future,” a program designed by Visiting Fellow and former Indianapolis Mayor Greg Ballard to grow leadership skills by teaching students to perceive change in a positive way. Citing tech visionaries like Bill Gates, who foresaw the concept of the smartphone in his 1999 book, “Business @ the Speed of Thought,” Ballard talked about change not only as a constant in history but also something that can have unforeseen effects on the world. From the early days of television and telephone communication to microprocessors and Snapchat, Ballard traced the evolution of technology and challenged students to understand the implications of new inventions. “You must not only study history, but also understand the moral and ethical values that are needed in a world where the pace of both technological and social change is so much faster than in past decades,” Ballard said. In a question and answer session following Ballard’s talk, students were ready to meet the challenge. Their questions ranged from preventing gun violence to bridging the digital divide to make technology accessible to underserved communities. One student asked if his generation was prepared for the foreseeable – and unforeseeable – future. Ballard answered in the affirmative, and urged students not to get discouraged by failure. “You are more aware and want to take action. Don’t think the world is falling apart. People do come to the forefront and do try to change things,” he said. Another student asked about the impact of social media on public discourse. Ballard encouraged students to pursue wisdom and compassion when they encounter opposing viewpoints – both online and in person. Ballard praised the students’ generation for developing the savvy to navigate new technologies, which prepares them to handle inevitable changes. “With technology, you can learn so much more about the world, and about history. Why did this happen? What can we do to prevent that sort of thing in the future? Use technology to become wiser,” he said. 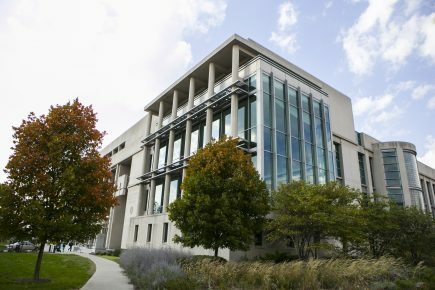 INDIANAPOLIS – The University of Indianapolis has partnered with the Indiana University Robert H. McKinney School of Law to create the University of Indianapolis Law Scholar. Each year, one student or alumnus will be nominated for the award and will receive: (1) a minimum half-tuition scholarship throughout their studies at IU McKinney; and (2) a guaranteed experiential learning opportunity of either an externship in the Indianapolis Bar or a research assistantship at IU McKinney. 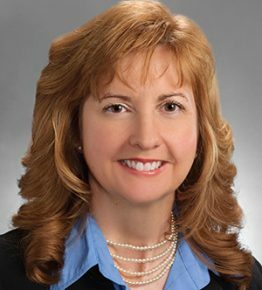 Candidates who meet established minimum eligibility requirements will be considered for the award, which will be selected by the University of Indianapolis Law Scholar Committee. The first Law Scholar will be awarded for Academic Year 2018-19. Dr. David Root, assistant professor of political science and pre-law advisor, initiated and established the partnership, which was formed in 2017. Starting in Academic Year 2018-19, one University of Indianapolis student or alumnus will be selected each year as the University of Indianapolis Law Scholar and will receive at least a half-tuition scholarship throughout law school as well as a guaranteed experiential learning opportunity. The experiential learning opportunity consists of either an externship in the Indianapolis Bar for academic credit or a paid research assistantship at IU McKinney, either of which begin after completion of the first year of studies. Additionally, the University of Indianapolis Law Scholar is expected to serve as a visible and active liaison between IU McKinney and the University of Indianapolis, demonstrating strong leadership during campus visits, recruiting efforts, and other joint measures undertaken by the two schools. The program is designed to assist students financially and experientially when they matriculate to IU McKinney and to encourage students to consider IU McKinney for their legal studies. 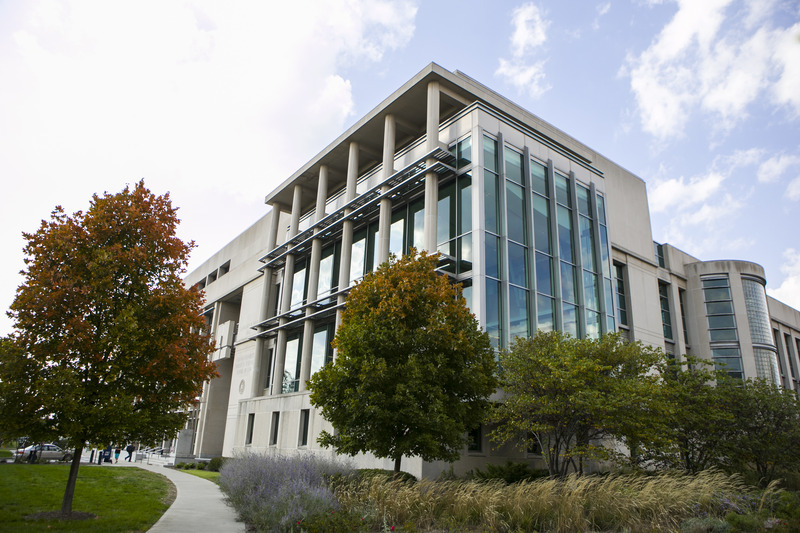 Eligible candidates must have completed an application to IU McKinney by March 1 of the year in which they are applying to law school as well as complete their award application by the same date. The University of Indianapolis Law Scholar Committee will then select and submit its nomination to IU McKinney by April 1. The awardee will be notified shortly thereafter. For more information about the University of Indianapolis Law Scholar, please contact Dr. Root at rootd@uindy.edu. 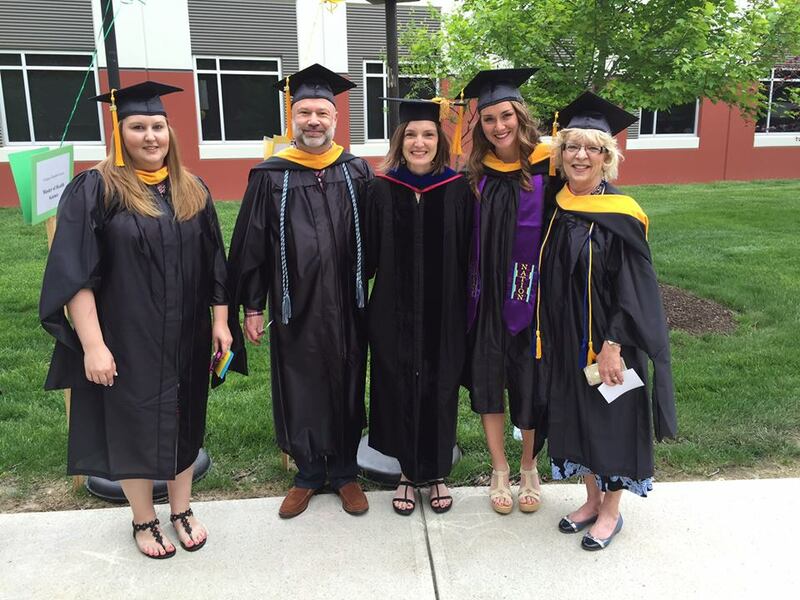 The University of Indianapolis Master of Science in Gerontology program has been named a Program of Merit by the Association for Gerontology in Higher Education (AGHE). This is the second time the program has been awarded the distinction. The University’s online M.S. in Gerontology degree is the only program of its kind to hold the honor. AGHE identified several factors that make the gerontology master’s program stand out. Those include the program’s close connection with the University’s Center for Aging & Community, which provides institutional support for the program; interdisciplinary partnerships across campus that give students exposure to a wide variety of educational experiences; and online course delivery that is executed in an intentional manner while provided a high level of versatility for students. AGHE also noted that the program responds to student comments in an effort to constantly improve the learning experience. “I’m proud to be a graduate of the UIndy gerontology program. The Program of Merit adds distinction and credibility to my master’s degree,” said gerontology alumna Kayleigh Adrian. In addition to the online master’s of gerontology program, the University of Indianapolis also offers online undergraduate and graduate certificates in gerontology. Learn more about those programs here. Hard work is paying off for two music education students from the University of Indianapolis. 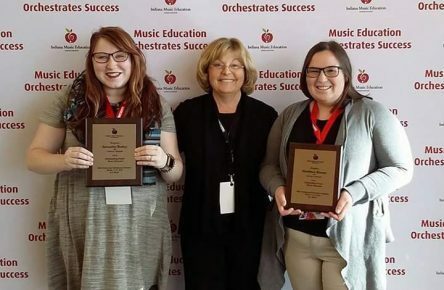 Samantha Burkey, choral/general music education ‘18 and Maddie Kintner, instrumental/general music education ‘19, received the Outstanding Future Music Educator Award at the Indiana Music Education Association’s annual professional development conference in Ft. Wayne in January. Burkey and Kintner are among an elite group of 18 University students to receive this award in the past 10 years. Burkey, who received news about the award a day into student-teaching, said the news was reassuring, because it let her know she’s doing something great in the world of music education. Through her classes, Kintner has logged at least 95 hours in immersive learning opportunities at regional band camps, in private lessons and in local middle school classrooms. She credits these experiences for helping her grow personally and professionally. Burkey, who has shadowed and student-taught at four local schools and volunteered with College Mentors for Kids, echoed that sentiment. To qualify for the award, students needed to demonstrate participation in their local NAfME chapter, academic rigor, and significant contributions to music education. 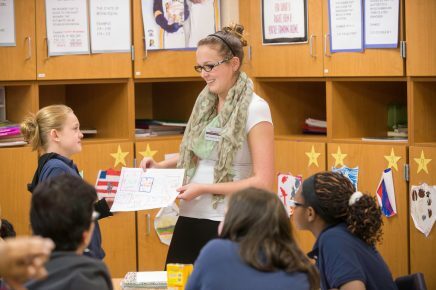 University student-teachers impact up to 700 Indianapolis Public Schools students every year by assisting teachers in classrooms. In 2017, the University chapter of the National Association for Music Education (NAfME) was recognized for its community outreach efforts to bring future music educators into classrooms. Kinter said the University helped her discover one of her true passions: helping students who have disabilities. One of her favorite experiences has been giving private cello lessons to a seven-year-old boy who is deaf and blind. She’s spent about 20 hours with him so far, and will resume lessons this spring. Learn more about UIndy’s music education program. 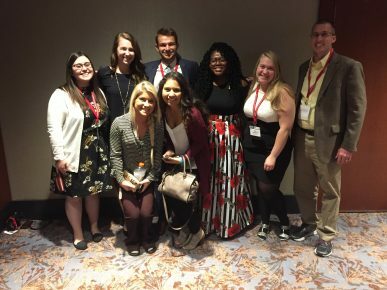 A unique partnership between the University of Indianapolis and the Indianapolis Star provided journalism students with valuable hands-on experience in the field–and the opportunity for a byline in Indiana’s newspaper of record. Students in the Investigative Reporting course published a story in the Indy Star that shed light on how the City of Indianapolis Mayor’s Action Center handles complaints. The months-long investigation, published in December 2017, examined data from the Mayor’s Action Center and found, for example, that poorer neighborhoods wait longer for pothole fixes. Jeanne Criswell, associate professor and director of the Department of Communication’s journalism program, taught the course, which brought together 14 students to work with the Indianapolis Star’s Alvie Lindsay, news and investigations director, and Tim Evans, investigative reporter and consumer advocate. Criswell said the Indy Star journalists served as role models, mentors and editors as students applied their skills in information gathering, verification and analysis and publication. “The Indianapolis Star partnership and the expectations of its dedicated journalists gave the students an invaluable, project-based professional experience and inspired them to produce some insightful investigative reporting,” Criswell said. Read the investigative story here. The students who contributed were Zoë Berg (Reflector editor-in-chief), Erik Cliburn (Reflector managing editor), Tyler Conrad, Laken Detweiler, Chelsea Faulk, Kaley Gatto, Tanner Gurin, Anthony Lain, Emily Mills (WICR operations manager), Elisha Sellars, Skylar Sigman, Kieffer Simpson, Dallas Thacker and Ryan Wright-Jordan. 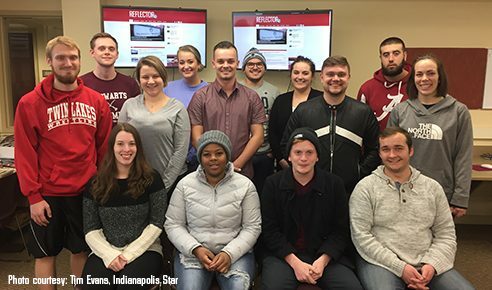 The University’s Department of Communication has enjoyed a long history of experiential learning with the Indianapolis Star, including guest lectures and hosting students for on-site visits. Meeting the expectations for publication was a clear goal for the students, who praised the department for offering real-life experience and the opportunity to work with professional journalists. “Working with the Indianapolis Star, I wanted to do my best in order to make my work worth being in the paper. Now, after looking at the printed and online version of our story, it makes me feel accomplished as a student and proud to have had this opportunity,” said Kaley Gatto, ’18 (communication major, experience design minor), who handled still photography for the project. Dallas Thacker, ’17 (communication), created a graphic that accompanied the story. He came to appreciate how much effort goes into an investigative reporting project. “The idea to have this type of class where you work directly with professionals in the career paths that we’re looking to pursue is absolutely outstanding,” Thacker said. Criswell said the department consistently collaborates with a wide variety of news organizations for internships, guest lectures, consultations and judging. Faculty also work with the news media on a regular basis in their roles with various journalism organizations such as the Indiana Collegiate Press Association, Indiana Association of School Broadcasters, Society of Professional Journalists and others. 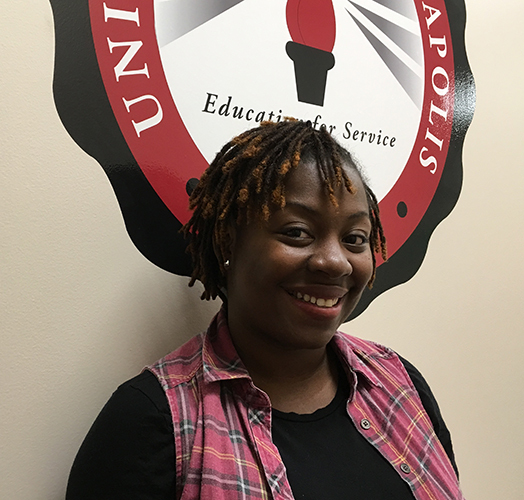 Jas’Minique Potter ’18, a student in the University of Indianapolis Teach (STEM)³ Program, discusses the built-in mentorship, preparation and support that foster an exciting career change from engineering to teaching. Jas’Minique (Jazz) Potter ’18 (MAT) is always amazed when she asks students what they think engineers do. As an engineer for Rolls-Royce Corp. in Indianapolis, Potter designed structural components for aircraft engines. Now she is translating that knowledge and field experience to her dream career of teaching STEM to high school students through the University of Indianapolis Teach (STEM)³ Program. Her goal is to prepare students for the workforce of the future. “It’s about getting students to think about how technology impacts the world and the jobs they’ll have when they’re older,” Potter said. The Teach (STEM)³ Program, funded through the National Science Foundation Robert Noyce Teacher Scholarship Program, focuses on preparing secondary-level (middle/high school) STEM educators. The program meets a growing local and national need by bringing professionals from STEM-related fields to pursue a teaching career. Potter joined the program in 2017 after working for several years as a design engineer at Rolls-Royce, a leading industry supplier for aircraft engines and other industries. She will graduate in 2018 with a Master of Arts in Teaching (MAT). The Robert Noyce Teacher Scholarship Program includes a stipend which allows candidates to complete the intensive, one-year program without undue financial hardship. Candidates must commit to serve as middle or high school STEM teachers after graduation. “I felt like this program was a perfect combination of things to help me get to my dream to become an educator. I was trying to find the time to transition into the education field and really pursue my passion,” Potter said. The University’s Teach (STEM)³ program is designed for career changers who have a STEM-related degree coupled with a passion for pursuing a teaching career. The program includes a clinical residency, a unique graduate experience that offers candidates the opportunity to partner with a master teacher in a classroom throughout an entire school year while simultaneously completing their coursework to obtain the MAT and teaching license. Potter is teaching a geometry course to sophomores at Ben Davis High School in Indianapolis for her residency. “One of the things that stuck out to me about the program was that it was a one-year program that would get me the experience in the field prior to graduating and offered a stipend to fund my tuition,” Potter said. With a bachelor’s degree in mechanical engineering and professional experience at Rolls-Royce, Potter is excited to apply her skills and knowledge in the classroom. Teach (STEM)³ allows her to do that immediately. That experience is a key component of the program. “As a career changer entering the teaching profession, Jazz brings a wealth of practical knowledge she will be able to use to engage students in real-world math experiences as she designs engaging lessons,” added Deb Sachs, Teach (STEM)³ Program director and assistant professor. 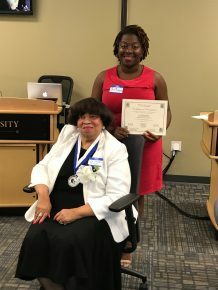 Potter was one of four students from across the state to receive a scholarship by the Indianapolis Alliance of Black School Educators at the 10th Annual IABSE Education Forum. Her scholarship was named in honor of Dr. Frankie Cooper, former IABSE president, whom she had the honor of meeting at the forum. 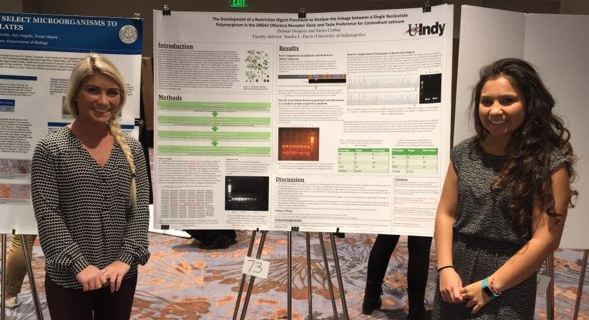 In April 2016, the University of Indianapolis launched its first #UIndyDay effort with the identification of several projects alumni and friends could contribute to. 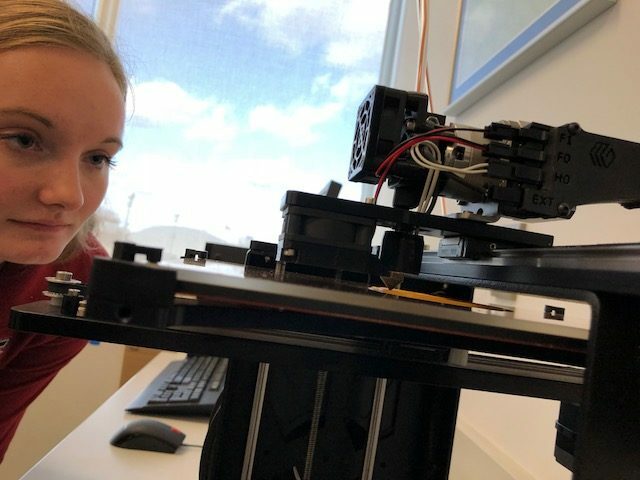 One of those projects, and the one that garnered the highest amount of contributions, was a 3D printer for the School of Occupational Therapy. Now, two years later, Erin Peterson, assistant professor of occupational therapy, is leading the school’s efforts to determine how to best use the technology to enhance OT education for both master’s and doctoral students. At Peterson’s recommendation, the school purchased a Maker Gear M3 printer in the summer of 2017. Since the arrival of the 3D printer, Peterson has been partnering with the School of Engineering to collaborate on designs for assistive devices and anatomical models that can be 3D printed. Along with the 3D printer, SOT purchased a 3D scanner that takes multiple pictures of a 3D object. The user can then edit and manipulate the 3D model of the object using special software. 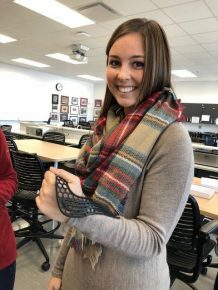 In OT, this could allow a therapist to scan a person’s hand, arm, or other body part, upload the file to the software, and then design a custom orthosis around that body part. Peterson admits that the technology has raised some concerns among the OT community. In particular, many hand therapists have expressed concern that 3D printing splints or assistive devices takes the OT out of the equation. An OT student research group recently conducted a survey of occupational therapists’ perceptions about the use of 3D technology in the practice of occupational therapy. Those survey findings, based on approximately 300 responses from members of the American Society of Hand Therapists, will be presented at the American Occupational Therapy Association’s Annual Conference in Salt Lake City, Utah in April 2018. Back row: Kaity Sullivan ’18, Lauren Bryant ’18, Casey Wendorff ’18, Dierra Barlow ’20, Zoe Cunningham ’20 & Jim Williams, associate professor of history and director of the Honors College. Front row: Sierra Corbin ’18 and Delmar Oropeza ’18. 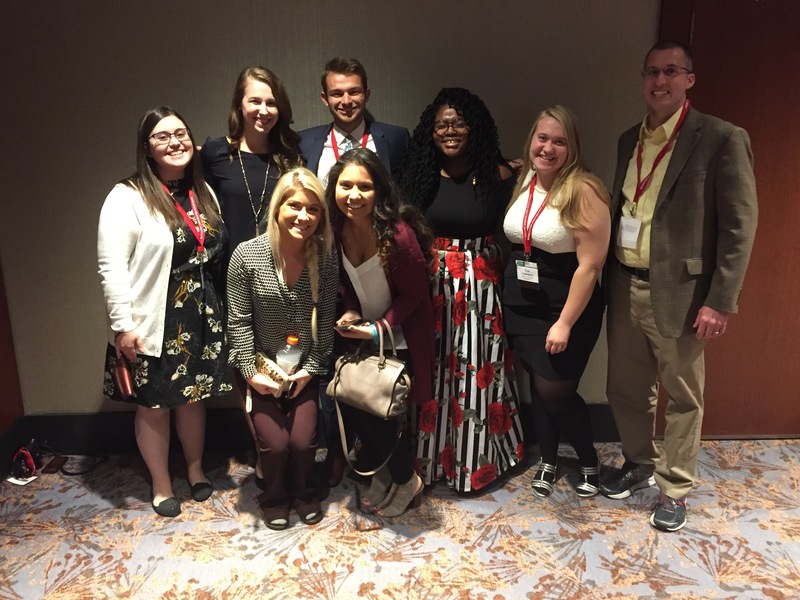 Students in the Ron & Laura Strain Honors College recently participated in the National Collegiate Honors Council (NCHC) Conference in Atlanta, a national event to showcase the benefits of honors education and research. Casey Wendorff ’18 (biology, chemistry minor), Kaity Sullivan ’18 (accounting and mathematics) Sierra Corbin ’17 (biology, chemistry minor) and Delmar Oropeza ’17 (biology, chemistry minor, pre-pharmacy concentration) presented research posters. Dierra Barlow ’20 (theatre, psychology) and Zoe Cunningham ’20 (theatre) performed in a drama master class. Lauren Bryant ’18 (biology and psychology) acted as a moderator during the conference. Jim Williams, director of the Honors College and associate professor of history, led several sessions on Honors advising. 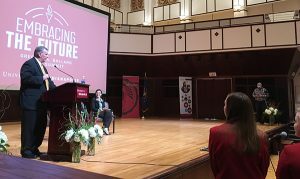 He highlighted the unique experience for students to travel to a national conference and represent the University of Indianapolis. “It allows them to showcase the hard work they’ve done on their original scholarship, which is great for their professionalization, and they see the kind of work honors students and colleges are doing across the country,” Williams said. Corbin and Oropeza received a research grant from the Sigma Zeta National Honor Society and presented their results at the conference. The grant funded materials critical to their project, which set out to determine a procedure to test for a genetic marker for the taste preference of cilantro. “The experience at the conference was beneficial. We received feedback from judges so that we could improve our skills presenting scientific research. It also was quite interesting to see what other students around the United States study,” Corbin said. The students worked with Sandra Davis, associate professor of biology, who suggested the idea. “I really enjoy watching students go from doing simple lab activities as part of a class to taking ownership of their own project. This is one of the opportunities that UIndy is able to offer that students might not get at a larger school. I hope to use their project in my classes and I have already had faculty from other universities express interest in using it as well,” Davis said. Learn more about the Ron & Laura Strain Honors College at UIndy. Corbin said the Honors College’s focus on presentations helped her develop skills in explaining complex topics to an audience that may not have specific knowledge of that subject. Her career goal is to become a physician assistant. “I am sure I will need to explain to patients what an illness may be, what caused it and how to treat it,” she said. The research component of Honors College also was integral to their skills development, the students said. “The research experience and the Honors College in general allowed me to expand my learning and communicative capabilities, especially in public speaking. There was a lot of reading and interpretation of papers that took place, which allowed me to expand my analytical intake,” said Oropeza, who plans to attend pharmacy school following graduation in December. 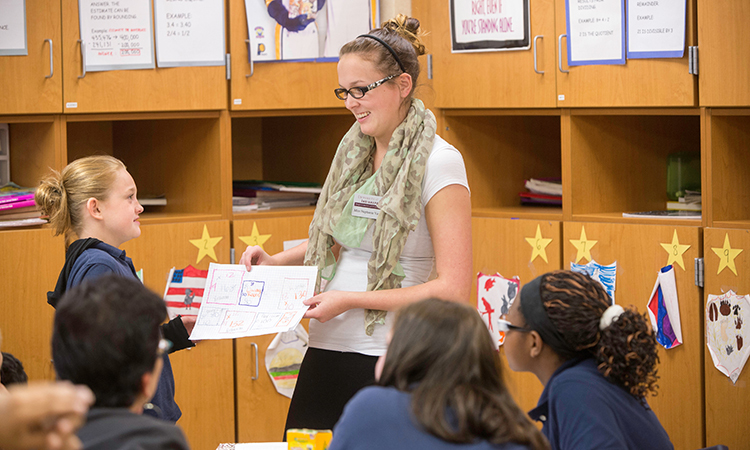 “At UIndy, the teachers genuinely care about our academic success. Some of our courses definitely are harder than they would be at other schools, but that makes us more prepared,” Corbin said. The Indiana Commission for Higher Education (ICHE) has awarded the University of Indianapolis nearly $2.4 million in grants to support the University’s continued leadership as a major incubator for STEM teachers across the state. The grants are part of a $9.6 million investment by the Commission to the STEM Teacher Recruitment Fund, created by the General Assembly in 2013 to put more STEM teachers in high-need classrooms across Indiana. Of those funds, UIndy’s Teach Today: Transform Tomorrow Elementary Education STEM program was awarded $262,801. In addition, Independent Colleges of Indiana (ICI) received $2.1 million, support which is administered by the University’s Center of Excellence in Leadership of Learning (CELL) to provide dual-credit credentials for current STEM teachers. The $2.1 million was awarded to the STEM Teach program, a continuing education program for current teachers,designed by CELL in partnership with ICI. CELL will collaborate to organize outreach activities and meetings, a higher education course proposal process and organization of a leadership team to select courses or course sequences. 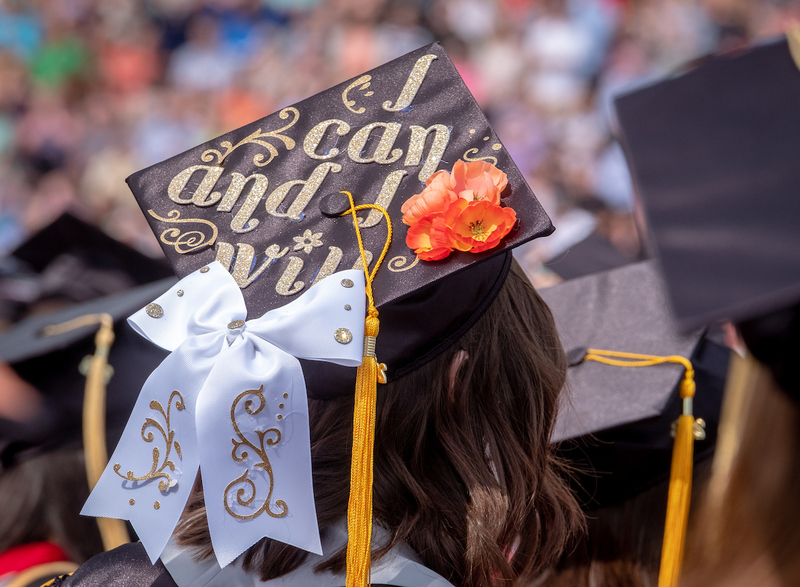 ICI serves as the fiscal agent and leads communication with higher education leadership while also managing teacher participation and completion data. CELL will manage day-to-day operations, including communication with K-12 teachers and schools, sharing process details with higher education institutions, development and operation of teacher application and registration processes, surveying participants, analyzing data, and generating reports to participating institutions and Commission. “Rather than putting a financial burden on teachers to meet dual-credit credentialing, STEM Teach will provide free and easily accessible graduate courses in the STEM areas. While increasing teacher STEM knowledge, the initiative also helps teachers meet Higher Learning Commission requirements and ensures that Early College High Schools continue to support increased college degree attainment in Indiana,” said Janet Boyle, CELL executive director. The STEM Teacher Recruitment Fund also awarded more than $262,000 to the University’s Teach Today: Transform Tomorrow program. Nancy Steffel, director of the University’s elementary education program and professor of teacher education, and Libby Turner, instructor, wrote the grant for the program, which promotes 21st century skills with a STEM focus. The program is delivered through the collaboration of the School of Education, Shaheen College of Arts & Sciences and the College of Applied Behavioral Sciences. “Teacher candidates will learn what they need to teach, how to teach it and why they need to teach it all at the same time instead of the traditional sequenced order of content, methods and field experiences,” Steffel said. The Teach Today grant focuses on the recruitment of talented high school students who show an interest in STEM and teaching to work with them as early as the 10th grade to develop the mindset around becoming a teacher. Candidates will graduate in three and a half years with more training in STEM, along with concentrations in reading and special education. Through the grant, inaugural candidates will receive a $1,000 stipend towards tuition and living expenses for their first year on the conditions that candidates complete the Elementary Education STEM program’s first year with a 2.75 overall GPA, remain in the University’s School of Education to earn their degree with a STEM teaching focus and teach in an Indiana elementary school for at least one year upon graduation. The program also will network with CELL and the STEM Teach program to reach out to teachers who can recommend potential teacher candidates. The program will join CELL’s Early College High School network meetings to help reach first-generation, socioeconomically disadvantaged and/or underrepresented population high school students. The Teach Today program uses a cross-curricular model suggested by the National Science Teachers Association and the New Generation Science Standards. Courses will be taught as STEM or education blocks with corresponding labs and field work that support the candidates’ learning. That interdisciplinary approach has been crucial to the success of recent STEM initiatives at the University of Indianapolis, including the University’s Teach (STEM)³ program funded through the National Science Foundation Robert Noyce Teacher Scholarship Program, which focuses on preparing secondary-level STEM educators. Although funded through separate grants, the two programs together represent the School of Education’s commitment to meeting the need for STEM professionals and teachers at every level of K-12 through interdepartmental collaboration. Formerly the Woodrow Wilson Teaching Scholarship Program, Teach (STEM)³ has graduated more than 70 STEM teachers since 2008, many of whom stay and work in Indiana schools. 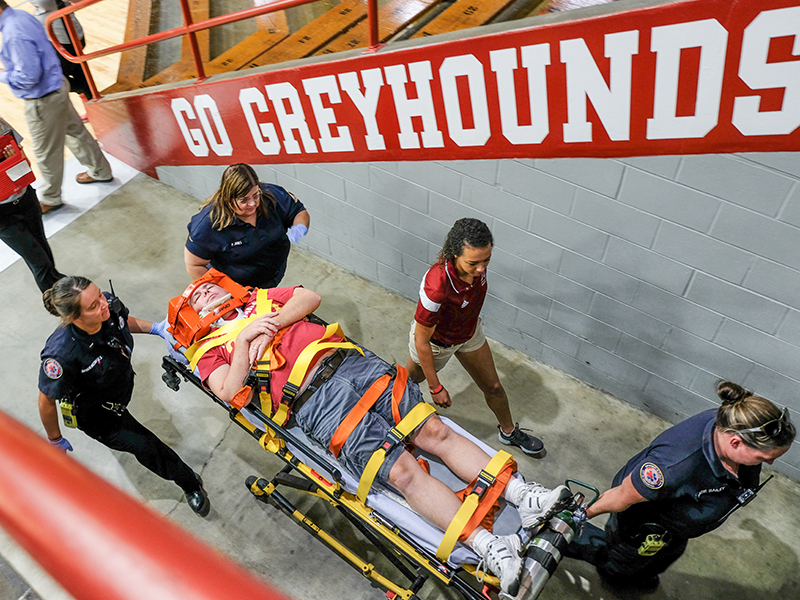 A man suddenly slips and falls in the stands at a basketball game at Nicoson Hall. He groans in pain as concerned onlookers jump to action. 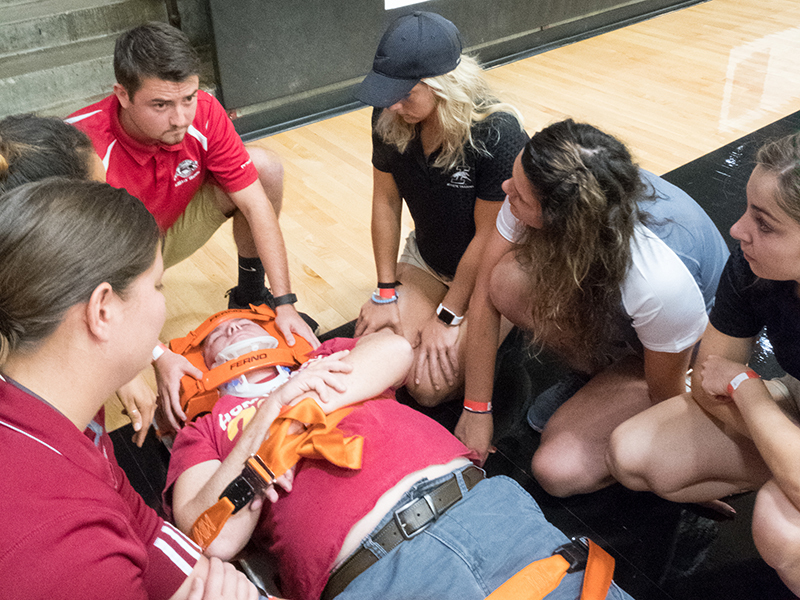 Athletic trainers quickly take their places around the patient and begin calling out instructions to protect his spine and head. 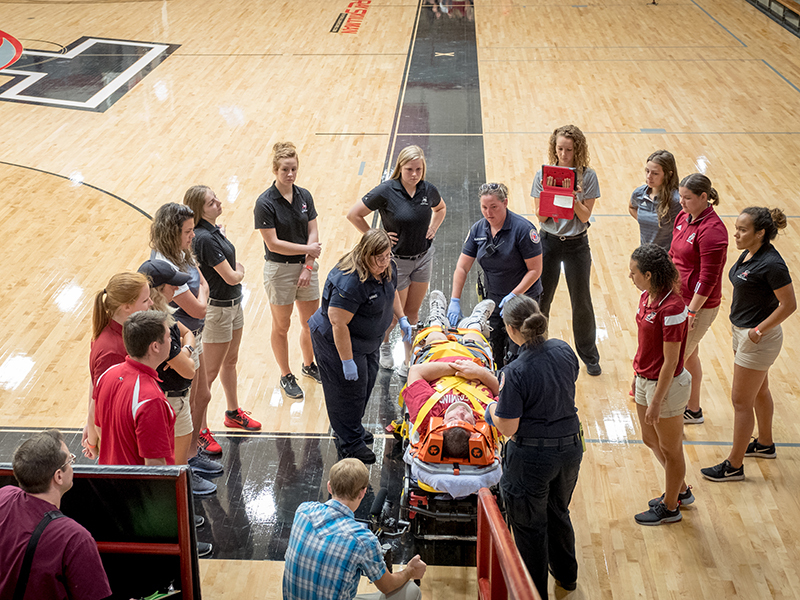 The sequence of events that follows–from the ambulance ride to the emergency room to post-trauma care and communication between medical professionals–plays out in a tightly choreographed event as trained health sciences students at the University of Indianapolis participate in a simulated emergency response scenario. 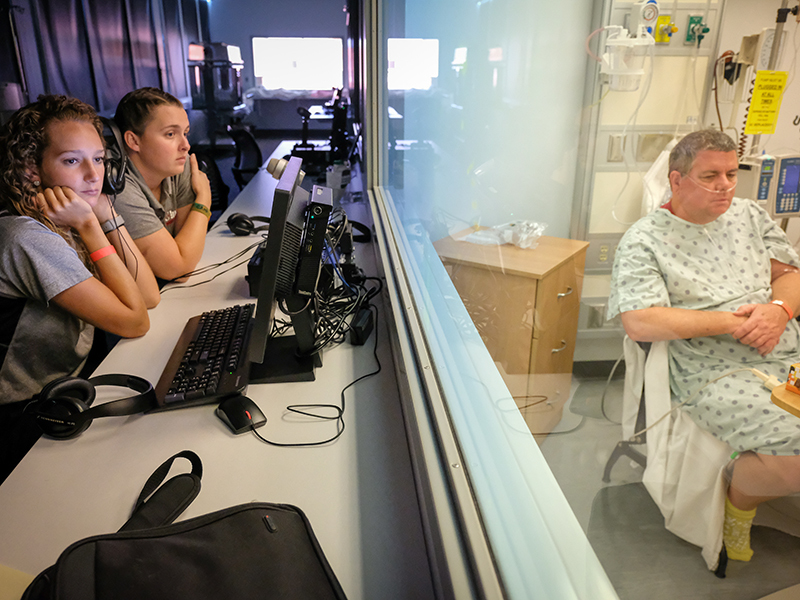 The exercise allows the students a “real-life” opportunity to implement the interprofessional and collaborative training that is integral to today’s trending model of healthcare. “There’s a big push in all of our professions to work more interprofessionally. 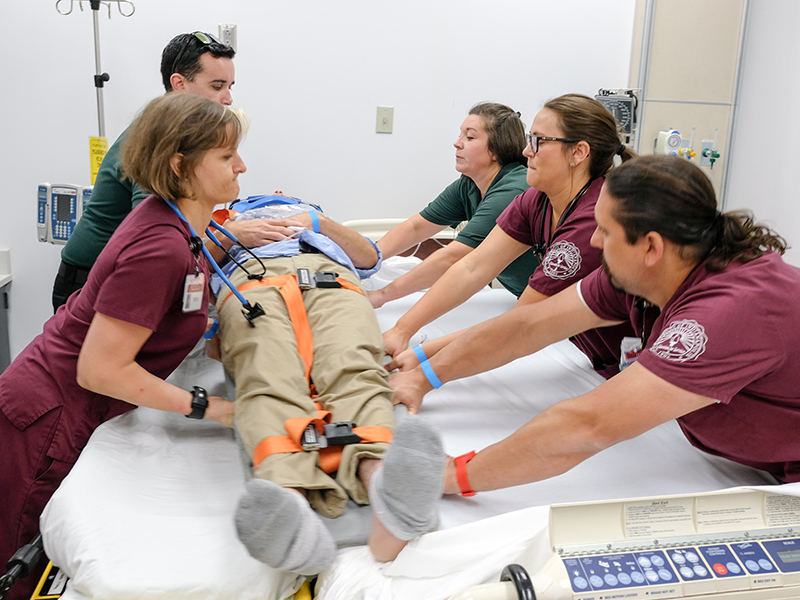 By giving students the opportunity to do that, that helps them to be more prepared for fieldwork, clinicals or internships,” said Alison Nichols, assistant professor of occupational therapy, one of several faculty members who helped to organize the simulation. 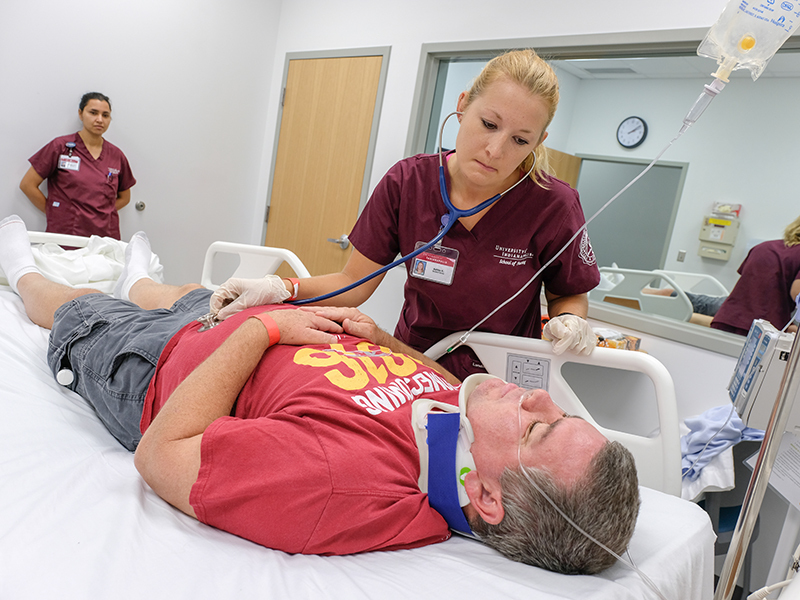 The carefully designed simulation provided students of several disciplines–nursing, physical therapy, occupational therapy, athletic training, psychology and social work–a chance to collaborate at all levels of an emergency scenario. 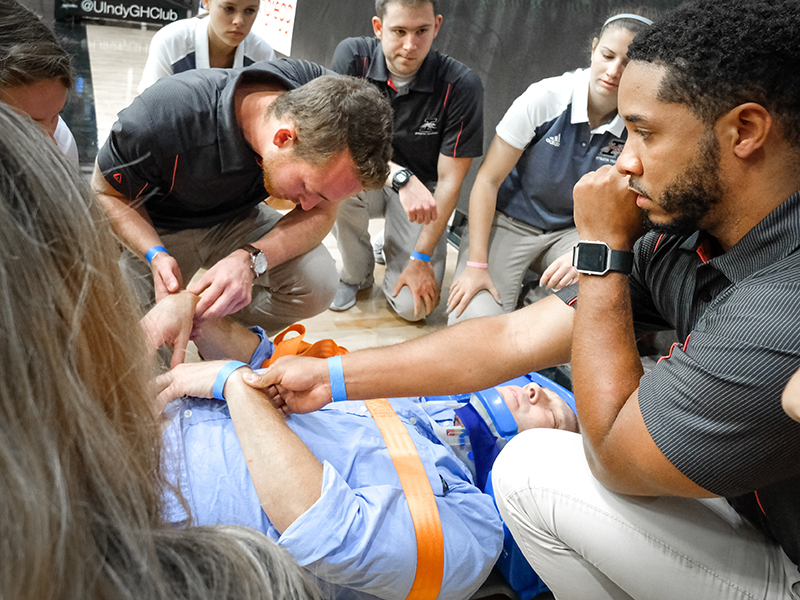 In this case, the patient simulated a serious injury at a campus event and was transported from Nicoson Hall to the UIndy Health Pavilion before being treated in the UIndy Simulation Center. Students coordinated the entire emergency response and treatment plan. “I was amazed at how important it was for us to speak with each other and to know what each other was doing at all times. By communicating with each other, we could avoid repetition and streamline things for the patient,” said Mimi Chase ’19, a graduate student in social work. That collaboration is an integral part of the unique and innovative partnership between Community Health Network and the University. 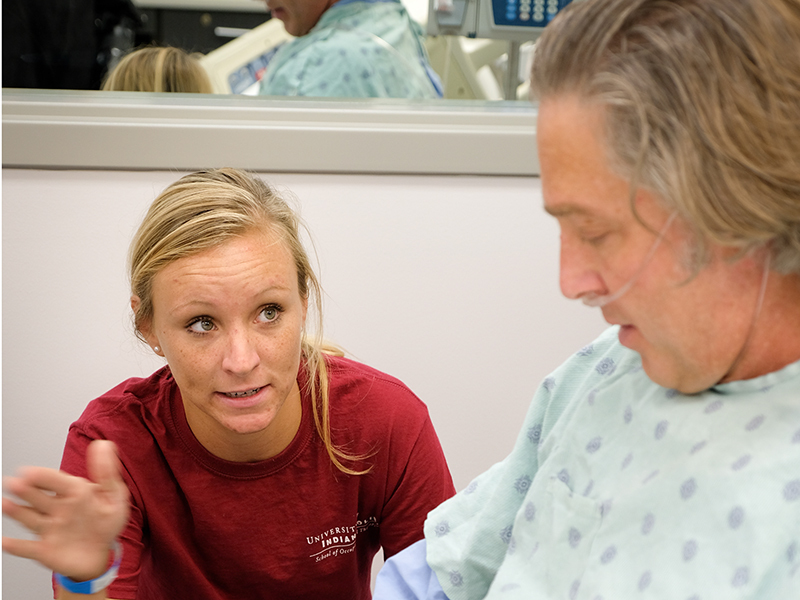 Through an interprofessional and team-based approach to learning, students enter the workforce with beneficial experience of collaborating with a variety of healthcare specialities to best meet the patient’s needs amid an increasingly complex healthcare system. 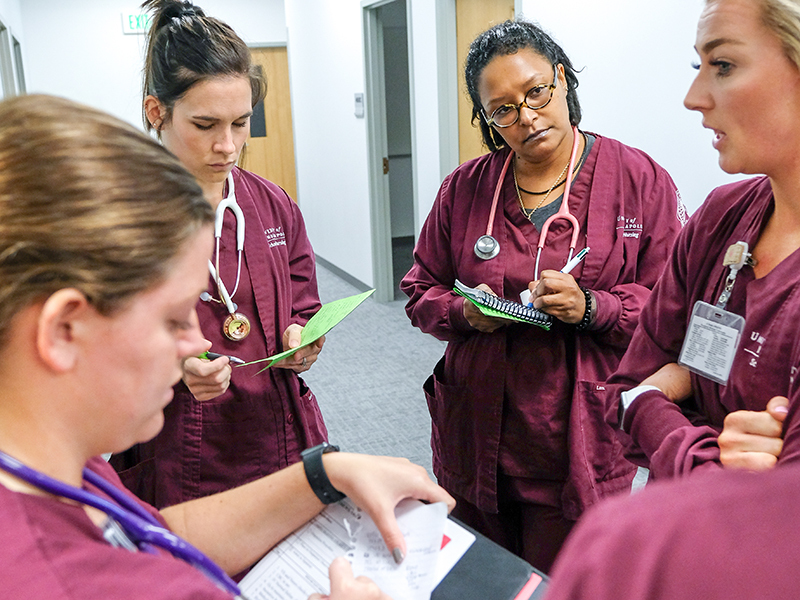 “You are teaching students to look outside the boxes of their professions and look at the other members of the team so that they understand each other’s roles,” said Gurinder Hohl, director, UIndy-Community Health Network partnership. Hohl explained how that philosophy can impact patient outcomes in a medical setting. Both from the patient and provider perspectives, it’s in everyone’s best interest to reduce hospital readmissions, she said. Effective communication across disciplines helps to improve that workflow. 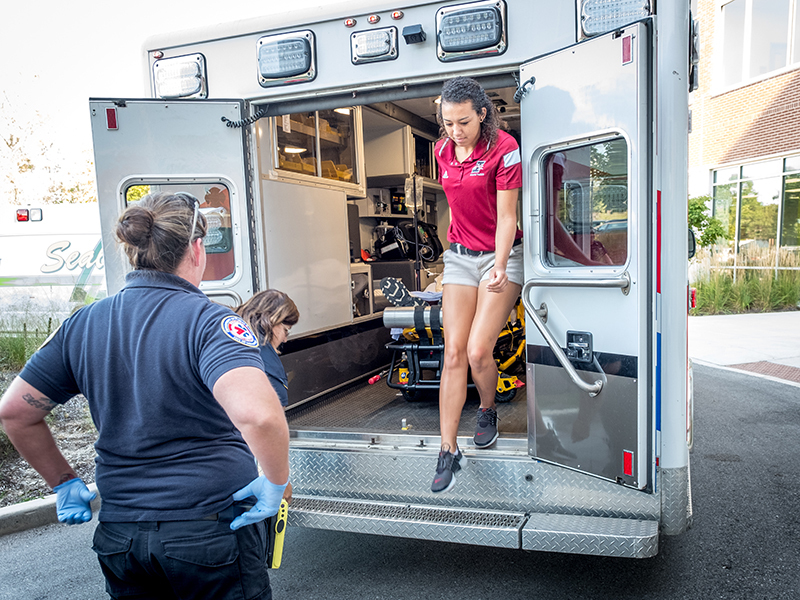 Paige Buddenhagen ’19 and Jamal Edwards ’19, athletic training, worked on the patient in Nicoson before the ambulance arrived. Edwards was responsible for the patient’s head, which involved calling out instructions to his colleagues as they loaded the patient onto a spine board to avoid further injury, while Buddenhagen coordinated an ambulance. 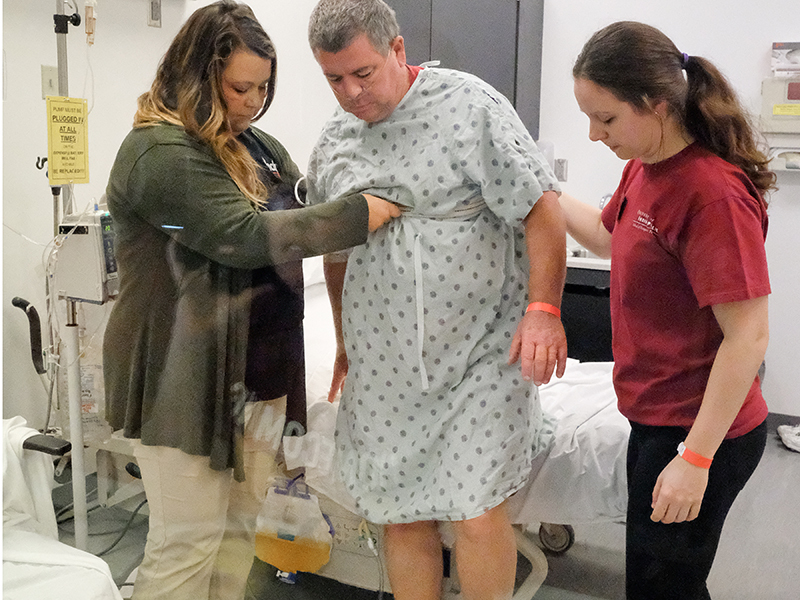 Once the patient was admitted to the hospital, occupational and physical therapy students had the opportunity to collaborate and evaluate the patient’s abilities and needs. Social work and psychology students had new roles to play when alcohol turned up as a factor in the case. Carrie Dettmer ’18, a student in the accelerated nursing program, explained that the team setting gave her confidence. 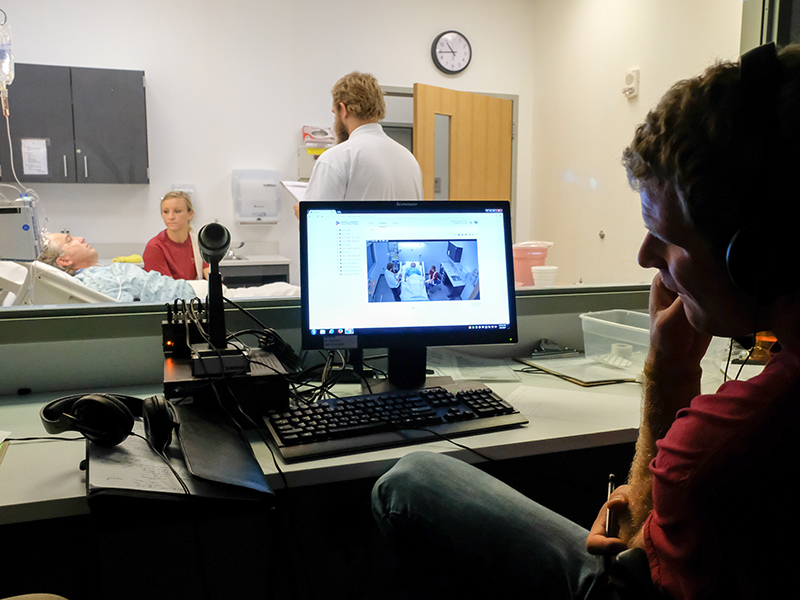 “When I came upon a situation with substance abuse with this particular simulation patient, I knew that I had the backup of social work and psych coming in behind me,” Dettmer said. Nurses collaborated with psychologists and social workers to determine the resources available to help the patient with addiction issues. Michael Craven ’20, clinical psychology doctoral candidate, played the role of staff psychologist at the hospital during the simulation. “It’s the direction healthcare is going. Being able to have practice, learning what it’s like to work side by side with physical therapists, occupational therapists, social workers, prepares us incredibly to be able to function in that environment,” Craven said.